Have you been dreaming of a new look for your kitchen? Maybe you wish your cabinet fronts had a more modern style or a less dated color. You don’t need all new cabinets to solve these problems. 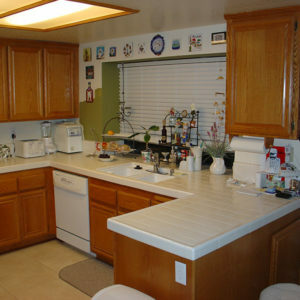 Simply let Cabinet Magic transform your cabinets with cabinet refacing in Laguna Niguel CA. What Is Cabinet Refacing in Laguna Niguel CA? With cabinet refacing in Laguna Niguel CA, most of your cabinetry will be left in place and reused. We will only replace the doors and drawer fronts. Adding or replacing crown molding is optional. Other exposed exterior surfaces such as the outsides of corner or end cabinets can be covered with a material matching your new doors and drawers. Your new cabinet doors and drawer fronts will be custom made just for you, to suit whatever design constraints you may have. You can have your choice of styles as well as just about any color of paint or wood finish. To get new functionality as well as a new look from your cabinet refacing in Laguna Niguel CA, you may want to consider getting new features like soft close hinges, drawer divider inserts, and pull-out shelves as part of the project. If you’re ready to transform your kitchen with cabinet refacing in Laguna Niguel CA, Cabinet Magic is here to help. We are confident we will meet and exceed your expectations with superior craftsmanship and service. Take the first step towards your new cabinets today by calling 800-828-4380 and requesting a free in home estimate.